If you need help moving in Aurora and the greater Denver, CO region, count on Aurora Moving Company for exceptional local service. Thanks to our vast experience in the moving industry in our area, we have moved homes, commercial business, and offices to and from every corner of Aurora. 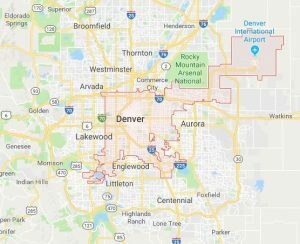 We also have plenty of experience in Englewood, Centennial, Lakewood, Littleton, and Parker. While moving locally might not seem like a huge undertaking, consider the manpower at your disposal, obstacles that may be in your way (staircases, tight hallways, elevators, etc. ), and the heavy items that need to be lifted and transported. You may find that local moving help is more affordable than you think. We offer free estimates, and low-cost rates. Call us today for more information. We provide full-service local moving solutions for residential homes, commercial businesses and offices big and small. Full-service moving includes planning, packing and unpacking, loading and unloading, and delivery of all items. Our movers are highly qualified, intensely trained, and have passed stringent background checks. Our moving trucks are modern and equipped with the latest equipment. With Aurora Moving Company you get value in terms of cost and peace of mind. We are careful with your items, work efficiently, and around your schedule. Our company is fully licensed and insured to provide moving help throughout Colorado and the United States. Our rates are affordable, and we promise to never blindside you with mysterious or hidden fees when the job is completed. Call us today for a free and accurate estimate, and trusted local moving assistance in Aurora, CO and beyond. We also offer dependable long-distance moving options.